putting the publisher's headliners together. The Justice Society of America, The All-Winners Squad etc. didn't recruit unknowns. In fact, until the JSA's very late years, when a majority of its members were losing their individual series, if a character stopped appearing under his own logo, he was dropped from the roster and forgotten. It's different now. Outfits like The Champions, The Mighty Crusaders etc. can include not just current stars of ongoing series, but also former stars of defunct series, supporting characters who never had a series of their own, and even non-stars, created solely for the purpose of joining the group. The major trendsetter — the first to debut by joining an established superhero team — was Marvel Comics' Wonder Man. 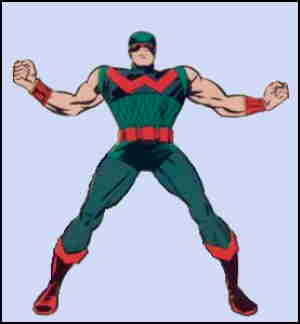 Wonder Man (no relation) was first seen in The Avengers #9 (October, 1964), and became a member in the same issue. But he was a trojan horse, given super powers by Baron Zemo (a prominent Captain America villain at the time) for the purpose of infiltrating their ranks and destroying them. Only a last-minute change of heart, when he chose to die (for the first of several times) rather than betray his new-found friends, saved them. The story was written by Stan Lee (who was responsible for practically everything Marvel did back then, from Ant Man to Ka-Zar's pet tiger, Zabu) and drawn by Don Heck (Iron Man, The Liberty Legion). Wonder Man was Simon Williams, a disgraced corporate executive who fell for Zemo's blandishments in a misguided attempt to build a new life. His death was a result of the powering-up process, a part he hadn't been told about going in — to keep him under control, Zemo had fixed it so he'd die without regular treatment that only Zemo could give. But his death, like so many in comic books, wasn't permanent. Even while dead, his presence remained with the team. They recovered the body and preserved it. It was later appropriated by his brother Eric, who had become a super villain called The Grim Reaper (no relation). Still later, brain patterns from it were used to give a human-like personality to another created-for-inclusion member, The Vision, an android who had started out soulless. Wonder Man finally recovered from death in #151 (September, 1976), and subsequently became a regular member. He came to regard The Vision as a brother of sorts, and became best friends with The Beast, also a member. After that, it was the usual lurching from one life-changing crisis to the next, as generally befalls comic book characters, especially those who don't hold down series of their own (which he did only for a couple of years in the early 1990s). He died a couple more times, but the "ionic energy" Zemo had charged him with ensured it wouldn't last. He became a Hollywood actor, then a stunt man, then an actor again. He's had relationships with The Scarlet Witch (The Vision's ex) and the former Ms. Marvel. He was a charter member of The Avengers' West Coast branch — and of Force Works, which grew out of it, tho he died again in that group's first issue. Currently, Wonder Man is alive. Text ©2005-10 Donald D. Markstein. Art © Marvel Comics.